Paranormality: Moonight On Its Way Out? Torchwood Continues. Don't quote me, but I read somewhere that "Moonlight" won't be returning. That makes me sad. Not because it's a good show. (Although I do find the lead male appealing.) But because it's a vampire show and a paranormal show and they just drop like flies. 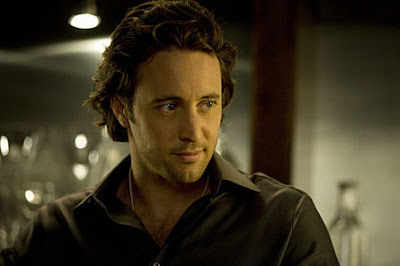 "Afterlife" on BBC America ended after one season. Then they gave up on "The Dresden Files" without even a good go. I haven't heard anything about the fate of "Blood Ties." I momentarily freaked today when I was watching the latest episode of the first season of "Torchwood," and the announcer said something about there only being a few episodes left. What? Another paranormal/fantasy show biting the dust? I googled "Torchwood" and discovered that season 2 is being filmed even now as I type. I wasn't sure if I was going to like this show or not, but turns out I do. So, I'm glad it will be around longer. Who knows how long it will take season 2 to reach the US. I don't have HBO, so I won't be watching the Sookie vampire show on that premium channel. I hope it floats. Ooh! 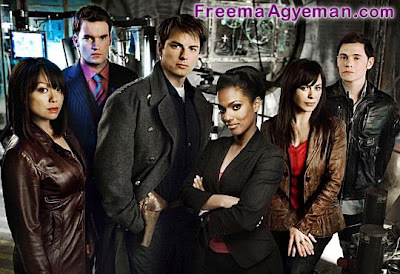 I just love that new promo pic of Torchwood with Freema's addition. Blood ties still plays on lifetime. Its now just on fridays at 10pm pacific time. Rae: I don't know what the problem is with the paranormal programs. You'd think they'd be as popular as what we're seeing in paranormal books. And when I look at what television programming consists of instead . . .
Gina: Yes. But we haven't heard what happens after these episodes air. I don't think a decision has been made yet. they will be back or they don't deserve another season.